PERGAMINO, Argentina/CHICAGO (Reuters) - Francisco Santillan, 55, a grains farmer from the heart of Argentina's soybean country, has two things on his mind: the rains and twists and turns in a bitter trade war between the United States and China that has hurt prices. The weather-worn farmer, who rides a Harley-Davidson around the 4,500 hectares of farmland he manages, is expecting a bumper soybean crop when he begins harvesting this month, but he and his neighbors are holding off from sealing deals with buyers in the hope a trade war breakthrough will bolster prices. 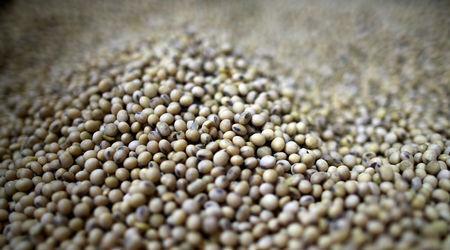 The United States and China, the world's top soybean producer and importer respectively, have slapped import duties on hundreds of billions of dollars worth of each other's products in their dispute. 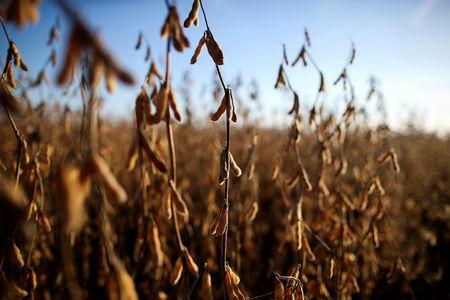 Tariffs made U.S. soybeans too expensive so Beijing stopped buying them, resulting in a glut that has hit soybean contracts in Chicago, the reference price for the global trade. Trump said on Wednesday that a trade deal with Beijing was coming along nicely, with U.S. negotiators poised to head to China next week for another round of talks. Negotiations to resolve the dispute have been turbulent - Trump also said on Wednesday tariffs would remain in place for a long time and last week that he was in no rush to reach a deal. Benchmark Chicago Board of Trade soybean futures are hovering near $9 per bushel, only about 90 cents above decade lows posted in September. "I am waiting for a better price," said Santillan, one of a group of farmers who spoke to Reuters among fields of green, knee-high soy plants in the country's fertile Pampas, where the ground was damp from heavy rains. "The season is coming along very well. The harvest will be above 55 million tonnes and that will have a huge impact on the economy," Santillan said. "But with news about the U.S.-China trade war determining Chicago reference prices, rather than supply and demand, it's like we are flying without instruments." Much in Argentina, the world's No. 3 soybean producer and the top exporter of soyoil and the soymeal livestock feed that is fuelling Asia's shift in diet from rice to pork and poultry, hangs on the soy crop. A severe drought last year dragged the economy into recession, while bumper tax revenues this year could help support government spending and prop up President Mauricio Macri's bid for re-election. Delayed sales could hamper that. Just 16.2 percent of this season's expected crop was sold by early March versus 30.5 percent at the same point a year earlier, government data show. The uncertainty over prices – and the delays to deals – could also rattle the global trade as major buyers look to lock in supply, namely Archer Daniels Midland Co, Bunge Ltd, Cargill Inc and Louis Dreyfus Co. The "ABCD" quartet, which dominates global grain trade, rely on a steady flow of grain to turn a profit in a typically thin-margin business. Farmers' reluctance to sell at low prices has stung the grains merchants recently, particularly Bunge, which blamed limited farmer selling in Brazil for earnings misses last year. Bunge's acting Chief Executive Gregory Heckman called Argentina "one of the larger wild cards" for the firm's oilseeds business in 2019, and said the firm anticipated farmers would hold more of their soybeans as a hedge against inflation and currency fluctuations. "Soybean sales are happening slower this season than at any point over the last 10 years," said a Buenos Aires-based grains broker. "Farmers are saying 'I don't like the price and I don't need the money now because I was able to make cash with wheat and corn. So I'll wait'." The uncertainty for the soy harvest comes at a complex time for President Macri too, who is battling to revive the economy while fending of challenges from political rivals ahead of national elections in October. "For Argentina, the trade war between the United States and China is piling uncertainty on a country that is already full of uncertainty," said Jorge Bianciotto, who manages a 2,300-hectare farm called La Lucila in Pergamino. 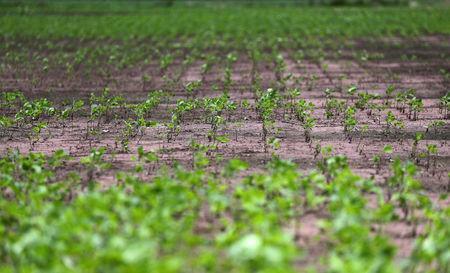 "This generates risks in terms of next year's planting and investment decisions." His neighbor, Juan Girado, who manages a 500-hectare plantation, shared his concern. "When they say the conflict is likely to end, prices rise. When the conflict looks like it's deepening, prices fall," he said. "So with a big crop on the way, and with prices as low as they are, it would be good for us for the trade war to end."